POSTED BY: Mark Skwarek | Wed May 14th, 2014 11:13 a.m. 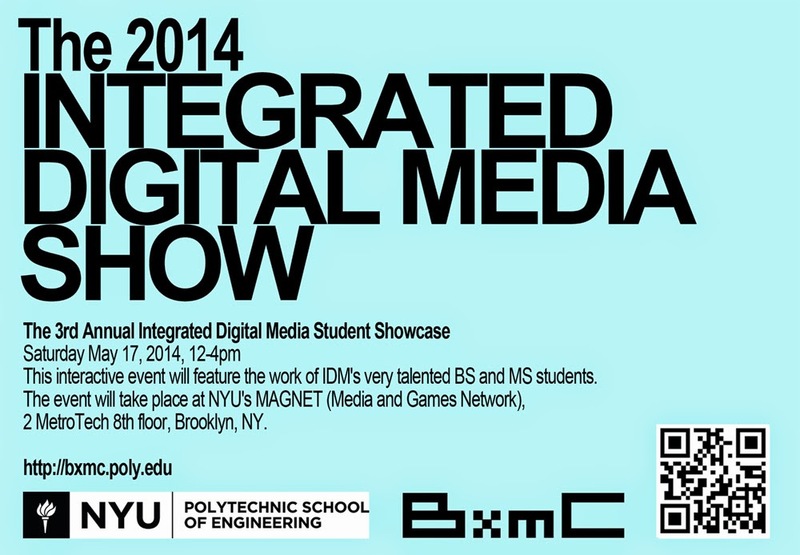 Please join us for the 3rd annual Digital Media Student Showcase, taking place at MAGNET (2 MetroTech Center 8th floor, Brooklyn, NY 11201) on May 17th from 12-4PM! The academic programs in Integrated Digital Media at the School of Engineering consist of both Bachelor's and Master's of Science degrees that look at the field of digital media in a holistic way, as a spectrum of practices that runs the gamut, from interaction design to performing arts research, to photography, video, sound, and 3D graphics, to games, augmented reality, and human-computer interfaces. Our students are artists, engineers, and entrepreneurs working in extraordinarily fluid industries that reward the creative, the thoughtful, the technical, and the innovative.